If you missed out on Vitrum Glass Group‘s June Glass Talks 2018 (and even if you didn’t, may we suggest Facade Tectonics? Hosted by the Insulating Glass Manufacturers Alliance, and sponsored by many industry leading advocates (ahem, us included), Facade Tectonics is offering an incredibly profound line-up of topics and speakers relating to glass and facade trends, design challenges, and new opportunities in design. Paulsen of RDH or “Healthy and Sustainable Glazing, Designing for People and the Planet”, by Joel Good of RWDI promise to be solutions-based and highly engaging. There are several other captivating topics that provide ample reason to register today. 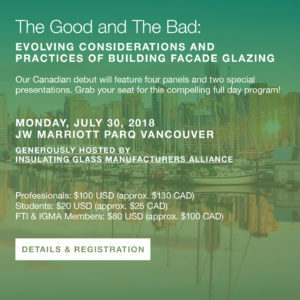 Go to https://facadetactonics.org/ftf-vbc18/ to register to attend on July 30th at the JW Marriott Parq Vancouver. Vitrum Glass Group is excited to sponsor this event, to attend in spades, and we look forward to connecting with all of our friends in the architectural and design community.